What to write next isn’t something I generally need to consider. I simply look at my calendar and see which deadline is fast approaching. Sometimes the deadlines are for work my editors have requested. Other times they are theme deadlines or from calls for manuscripts. But there are times, like right now, when I have very few deadlines. Then I have to think – which project should get my attention right now? Here are some of the things that I consider. What is ready to go? If a manuscript comes back home (translation: gets rejected) when I am in the middle of a big project, I often let it sit. At times like these, I gather these projects up and update the cover or query letters. Soon I have two or three pieces out the door. How much energy do I have? If I am coming off a huge deadline, I might pick something smaller to work on this time around such as a single activity for a new market or a calendar activity for Thriving Family. The pay is minimal but so is the word count. This is something I can have out tomorrow and if I make the sale it creates an opening at a new publisher. Is it seasonal or otherwise timely? Some submissions have to go out at a certain time of year. If that is now, this item is going to be at the top of my list. After all, if I put it off for too long, I will have missed my chance. I need to get it out while the timing is still right. Is this for a market that is often closed? Some agents and publishers aren’t always open to submissions. If I have something for one or the other and the door is open, I need to act on it right away. The same holds for a new agent or a new publisher. I want to get my work in their hands before they are overwhelmed. Is this idea demanding attention? There are those ideas that are bouncing up and down, hollering “Me, me! Pick me!” It takes enthusiasm and energy to carry any writing project from idea to submission-ready and if something is calling out to me, now is a great time to work on it. 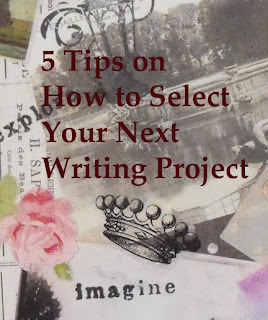 What criteria do you use when the time comes to pick out a new project? Sue Bradford Edwards blogs about her writing at One Writer's Journey. Regular "work" deadlines play a big part of choosing my next writing projects. I'm kind of in the same situation right now--I am in between deadlines for the magazines I write for regularly and just finished revising my middle-grade novel. I've been sitting here drinking coffee this morning and trying to figure out my next move(s), which include: researching agents and book publishers, writing some magazine copy ahead of time (!) and getting back to work on my YA. I should have included researching agents and publishers. I've been doing the same thing.